How Can Your Ocala Emergency Dentist Eliminate Tooth Pain? Recent studies have shown that dental problems account for countless emergency room visits a year. Believe it or not, according to the Journal of Endodontics, the hospitalizations for dental abscesses has increased by more than 40%! After studying the patients for a period of time, 66 patients just of those studied inevitably died from their dental abscess even after being hospitalized. “The seriousness of dental infections that go untreated or are treated too late is a bigger problem than we had estimated,” says Dr. Frank Catalanotto, chairman at the University of Florida College of Dentistry. Dr. Weldon of Weldon General & Cosmetic Dentistry couldn’t agree more—especially about the prevention aspect. So, what happens when you have an infected tooth? How can you catch it at an early stage and seek help from our dental practice? Let’s explore tooth abscesses and how your Ocala emergency dentist treats them. When your tooth has become infected and filled with pus, the medical term would be a dental abscess. This infection can take place inside the tooth or between the tooth and the gum line. In the beginning, it could just be an annoying twinge of pain or slightly uncomfortable, but it can quickly become excruciating. Abscessed teeth cause throbbing pain or sharp, shooting pain as well. Is my constant toothache throbbing and spreading to my jawbone, neck, or ear? 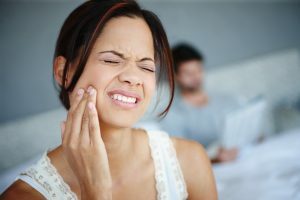 Are hot or cold substances making my teeth hurt or feel sensitive? Do my teeth hurt every time I chew or bite into food? Am I getting a fever at an abnormal time? Do I have swollen lumps under my jaw or in my neck (swollen lymph nodes)? Is there a foul smell in my mouth that won’t go away? Do I taste a salty, unpleasant taste in my mouth and experience pain-relief when the abscess bursts? Typically, if a tooth is irreversibly infected or dead, Dr. Weldon will perform a root canal to save the rest of your smile. Root canals have a reputation of being “scary and painful,” but research proves that the procedure isn’t the source of pain—the pain develops from ignoring the dental problem! Usually, the procedure is completed in one or two appointments, depending on the condition of your tooth. You can expect a comfortable experience during and after your appointment. Remove the infected root of your tooth and surrounding infected tissues. Access the inside of the tooth with tiny files that can gently reach the intricate crevices of the inside of your tooth. All signs of infection and pus will be cleaned and rinsed out. Fill the inside of your tooth with a rubber-like dental material to avoid future infections from taking place. Your dentist will then seal your tooth and cap it with a dental crown to protect and re-stabilize it, gaining your natural tooth’s functionality and strength once again. The procedure is virtually painless and our practice will use a local anesthetic to make your procedure as comfortable as possible. Naturally, the tooth may feel slightly sensitive, but this can be treated with over the counter pain medications. Contact us today to schedule an appointment to have your tooth pain evaluated by your Ocala dentist. Comments Off on How Can Your Ocala Emergency Dentist Eliminate Tooth Pain?